Despite the fact that Steve and I were not committed to wake up early to meet an appointment as was the caseTuesday morning, we both awoke at 6PM to the sound of barking dogs. Given the number of guests sharing one bathroom, rising ahead of the crowd was probably a good thing. The same two gentlemen from Ft. Collins that stayed at Red Butte Ranch a year ago were present again, and four additional fishermen rented the family cabin, so Ruth had a full house for breakfast. We savored our egg, ham, hashed browns, nut bread and yogurt and washed it down with tea and water. Steve and I allowed the fishermen scheduled for a float trip to clear out, and then we gathered our things and paid our bill and departed. Originally we planned to fish near the Red Butte Ranch before the flush arrived, but the four fishermen staying in the cabin were already waded in the river and staked out their spots so we changed our plans and drove to the tailwater below the dam. We stopped briefly at the Grey Reef Fly Shop across from the afterbay, and we each purchased a few flies. I bought three pine squirrel leeches since they were productive on Tuesday, and I hadn’t tied any. The temperature was amazingly 44 degrees at 9AM on Wednesday, so that was a pleasant surprise; however, the wind was a significant factor and swept across the relatively flat terrain unrelentingly. Only a couple fishermen were wade fishing between the boat ramp and the flume shooting from the dam, so Steve and I pretty much had our choice of water, and we decided to once again cross the dam on the footpath similar to Monday and fish back along the south side of the river. When we reached the far side we realized the flow was still fairly high, probably in the 1000 cfs range. Both of us kept our rods rigged in the same manner that Greg set us up, and we began fishing with the egg/red annelid worm combination on top and a pine squirrel leech on the bottom. Steve elected to begin where the river branched off from the main current and curled around the point of a long narrow island while I walked down the river a bit and began near the bottom of the island. Because the flow was strong at 9AM compared to Monday, I added a second split shot to my line. Much to my amazement I hooked and landed a thirteen inch rainbow fairly early, but then I fished through a 45 minute period with no action. I continued to slice 2X line through the currents, and this came in handy when I snagged my flies on a fairly frequent basis. By 10 o’clock I approached some faster water near the top of where the left channel curled around the island, and the flows had dropped noticeably. Since I had two split shot on my line I decided to drift my flies through some of the faster current toward the center of the run instead of working the inside seam and slower water that bordered it. Much to my surprise, I hooked and landed three fine rainbows from the faster run of moderate depth including a 17 inch silvery rainbow that sported a broken off woolly worm-style fly in its lip. I took a photo and removed my annelid worm and the broken off fly from the rainbow’s lip. When I reached the top of the island, I circled back to the area across from the boat ramp. This water looked very attractive, but between 2013 and Monday, I had yet to extract any fish. Finally along the current seam I managed to hook and land a small (by Grey Reef standards) rainbow of thirteen inches. Next I moved back upstream to a section between the boat ramp and the bottom of the island. 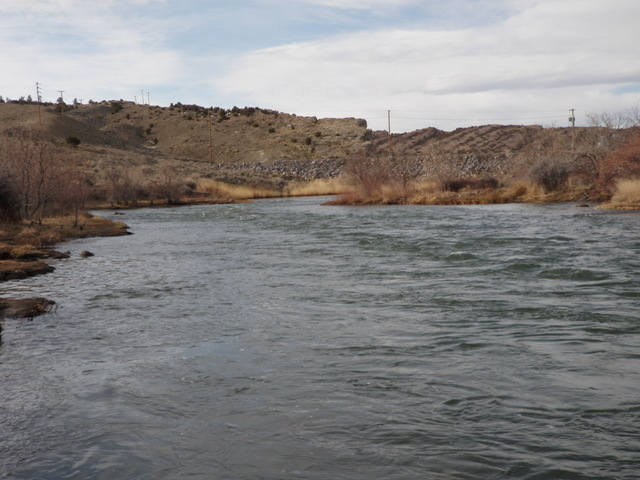 By now the level of the river had returned to normal flow for the end of March of around 500 cfs and the river structure was much easier to discern. I was at the bottom of a pair of nice pools that stretched for 30 feet below some current breaks, so I began casting upstream to the slack water and allowed my flies to drift back toward me along the current seams at the margins. By using this approach I landed two more nice rainbows including a colorful 15 inch specimen. One of these fish attacked the leech as I imparted some movement by twitching it at the tail of the drift. Steve decided to cross back to the side of the river near the parking lot, so I moved upstream to a long wide riffle stretch just below the island and fished it thoroughly while Steve crossed over at the dam. I didn’t have any luck in the riffle so I reeled up and attached my flies to a rod guide and hiked back across the dam to the other side of the river to join Steve. We worked some nice areas for another half hour or so, but by noon we had run out of interesting water, so we decided to explore some access points downstream that we’d observed on our float trip the previous day. We continued down the dirt road that led to the Grey Reef access for another three or four miles and stopped and checked out Pete’s Draw and The Redds. Pete’s Draw looked enticing on the opposite side of the main river current, but we didn’t feel we could effectively fish it from our wading positions, so we returned to The Redds. We were in the process of preparing to experiment with a nice run at The Redds, but I ran into some equipment problems, so we decided to call it quits and make the four hour return trip to Denver. Wednesday morning yielded some decent fishing, and we got to experience the higher flows and then the rapid decline and the adjustments that this type of rapid change in water level requires. 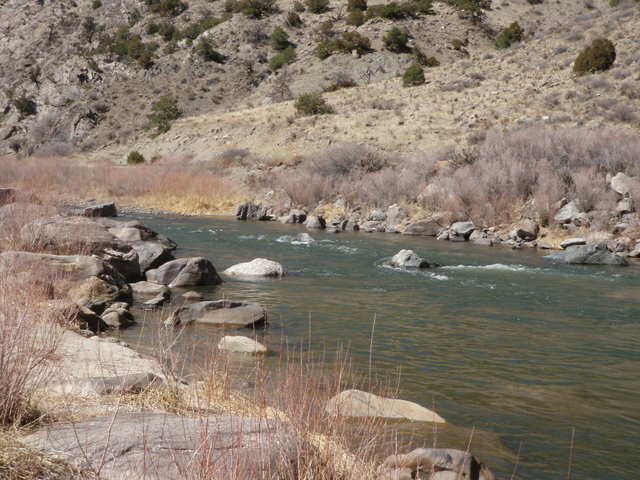 We now face the prospect of fishing Colorado rivers and in all likelihood catching smaller fish on average, but I know from past experience that it is really the enjoyment of being on the river and the challenge of fooling fish regardless of size that keeps me coming back. Location: From Grey Reef dam downstream to Lusby takeout. Well how did the the 2014 float trip on the North Platte River compare to the fishing that we experienced a year prior? If you read the header information of this post, you already know the answer to that question. The “flush” and 2X are really the storylines of this outstanding day of fishing on the North Platte at Grey Reef. 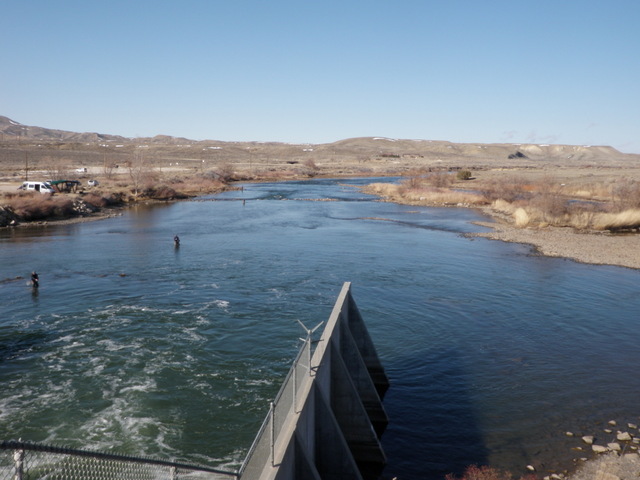 The flush is a process whereby the Bureau of Reclamation and Wyoming Game and Fish ramp up the flows from Grey Reef dam for five days during late March. The process begins at midnight and ends by 10AM as the outflow from the dam begins at 500 cfs and increases to a peak of 4000 cfs and then declines back to 500. 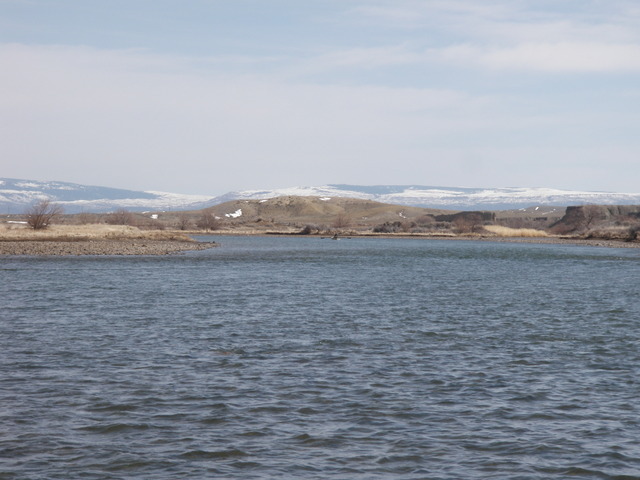 The purpose is to remove fine sediment from the gravel spawning beds used by the river’s trout, and judging from the fishing experience in 2013 and 2014, this event is yielding outstanding results. 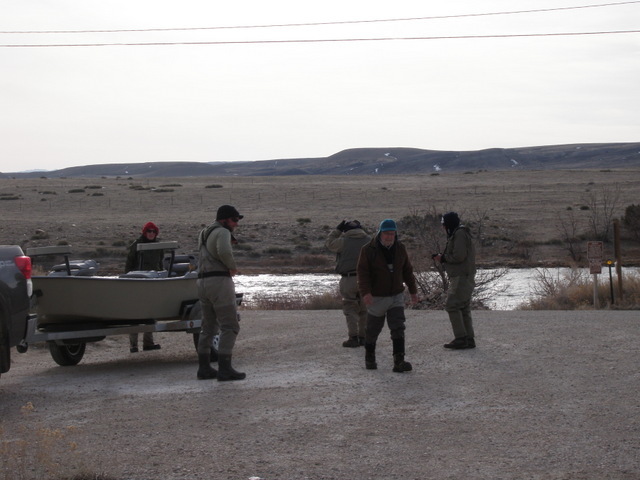 Our day of guided float fishing, Tuesday March 25, coincided with the next to last day of the flush. We learned in 2013 that this has minimal negative impact on the fishing since the local guides know how to work around it, and in fact it may improve fishing as the high flows dislodge annelid worms, leeches, and eggs from the stream bottom and vegetation. Steve and I arose at 6AM on Tuesday morning, and this allowed plenty of time to have a nice breakfast at the Hampton Inn and then gather our essentials for a day of fishing. We drove to the Red Butte Ranch where we met Greg Mueller, our guide. We each gave Greg the rods and reels we planned to use for the day, and he rigged them in the preferred Grey Reef manner while Steve and I adjourned to the garage and climbed into our frozen waders and wading boots. Once again I broke out handwarmers and toe warmers as I availed myself of every possible ploy to remain reasonably comfortable in the cold temperatures of early spring in Wyoming. The high was forecast to reach the low fifties, but the morning period before the sun rose high in the sky was my concern. We jumped in Greg’s truck and made the brief trip to the Grey Reef boat launch, and I couldn’t help noticing that the air temperature was hovering at 23 degrees at 8:30 in the morning. Was the weather forecast accurate? Quite a few fishermen, guides and drift boats arrived at the boat ramp simultaneously, but Greg jumped in quickly, and we took off slightly ahead of the others. Steve graciously allowed me the position in the bow while he took his seat in the rear, and we pushed off. Greg had me set up with two separate yellow-green eggs paired a couple inches above an annelid worm fly along with a single split shot and a red and white thingamabobber near the junction with the fly line. Steve had a similar set up, but instead of two egg and worm combinations, he had a pine squirrel leech as his bottom fly. It didn’t take long before my indicator dipped and I set the hook and felt the throbbing weight of a nice fish. As I cautiously played the fish in a manner similar to my custom in Colorado, Greg announced that we were using 2X tippet on all the connections, and pointedly suggested that I should “reef the fish in quickly”. He was right as the combination of the Scott six weight rod and 2X line made it virtually impossible for the rainbows to break off. Amazingly the abundant population of rainbow trout in the North Platte River below Grey Reef demonstrate virtually no fear of fishing line. The rest of the day continued pretty much in the manner I just described. Very little time transpired between hook ups, and Steve and I landed 30 plus fish each between 9AM and 4:30PM when we pulled up on shore at the Lusby take out. Of course each of us experienced 3-5 foul hooked fish and perhaps five additional momentary hook ups in the span of eight hours of fishing. Part way through the morning, Steve began to catch fish on his pine squirrel leech, so Greg removed my bottom egg/worm combination and replaced them with a dark colored leech. The leech became equally as productive as the eggs toward the middle of the day, but the egg seemed to outperform in the early morning and late afternoon. 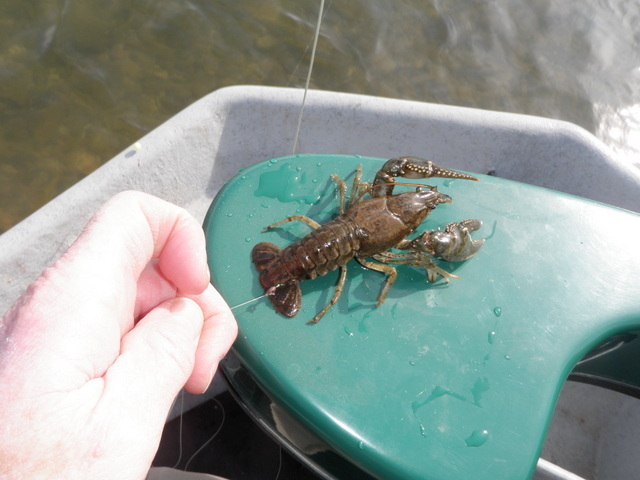 There was also a period during the late morning when Greg added a small bionic midge as a third fly to my setup, but the only midge success I can report is a four inch crayfish that latched onto the tiny fly. 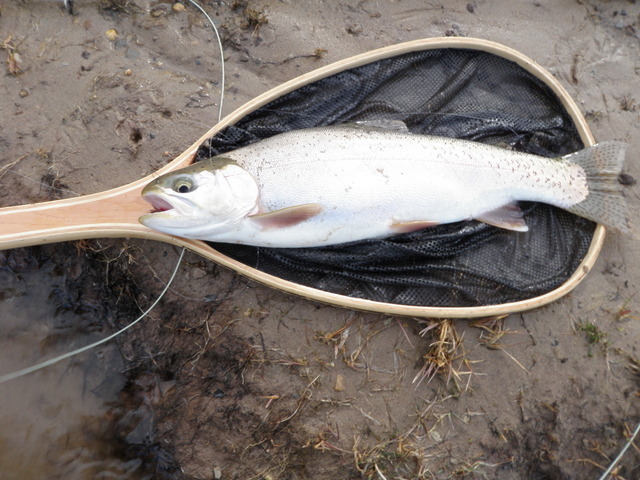 All my trout were rainbows except for a small thirteen inch brown that I landed quite early in the float. The size of the rainbows ranged between thirteen and eighteen inches, and I managed to land two or three in the upper end of that range. In my opinion the fishing on March 25 was just as outstanding as our previous float trip a year earlier. Catching thirty rainbow trout averaging 14 to 15 inches in eight hours is a superlative experience that I won’t soon forget, and in fact my major concern is that I’m spoiled for Colorado fishing just as the season kicks off. What a way to start the 2014 season with an action packed day on the North Platte River! The weather also played a part in our enjoyment as the sun warmed the air quickly and the high temperature actually reached 60 degrees late in the afternoon. Three cheers for the flush and 2X. 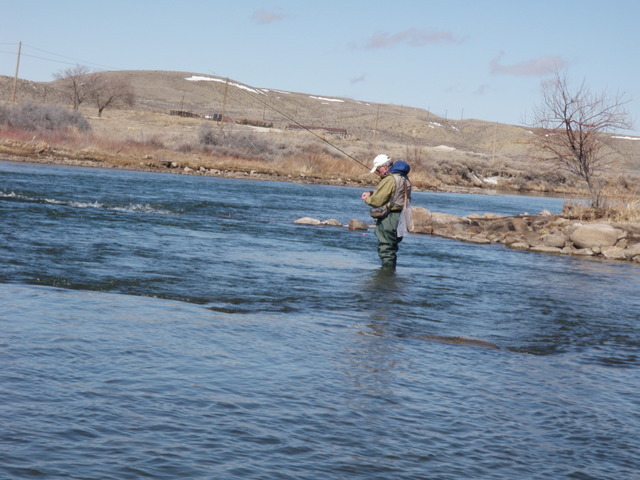 At roughly the same time a year ago my friend Steve and I completed a fishing trip to the North Platte River below Grey Reef dam, and we had a great experience, so we decided to return for an encore. We were both amazed by the quantities and size of fish we were able to land in this tailwater fishery four hours away from Denver, CO. Steve took care of the booking details and arranged for a full day guided float on March 25 with the same guide that we used in 2013. We also attempted to book lodging at the Red Butte Ranch similar to our previous trip, but that didn’t work out exactly as planned. The main question in our minds was whether the fishery was as excellent as our 2013 trip indicated, or was it just an aberration caused by some confluence of factors? The parallels between 2014 and 2013 were uncanny. Once again we planned to leave on Monday morning and drive to Casper, buy our fishing licenses and supplies, check in to the bed and breakfast, and then visit the tailwater and wade fish for a few hours. Our guided float trip was once again scheduled for Tuesday, and then we expected to wade fish on Wednesday into the early afternoon before packing everything up and returning to Denver. This mirrored our previous trip, but more eerie was the developing weather pattern. In 2013 a storm dumped snow in Wyoming on Saturday and that was followed by a cold snap of a couple days with gradually warming temperatures on Tuesday and Wednesday. The weather forecast for 2014 matched this almost degree by degree. Steve arrived at 8:15AM on Monday, and I was all set with my bags packed so we loaded the car and departed. There was some fresh snow on the highway between Ft. Collins and Cheyenne with signs warning of icy patches, so Steve was extra cautious as we traveled through this area. We stopped in Casper for a quick lunch and arrived at the North Platte Fly Shop by approximately 1PM. Steve and I each purchased non-resident Wyoming three day fishing licenses and continued on our way to the Red Butte Ranch bed and breakfast. Unfortunately upon our arrival we learned from the owner, Ruth, that she had overbooked and there weren’t any beds for us on Monday night! We still had the New Zealand room for Tuesday, but needed new accommodations for Monday night. Ruth put us in touch with Liz, and owner of the guide service, and Liz reserved a room for us at the Hampton Inn in Casper. This added another 15 miles or so to our trips to and from the river, but it worked out to be a nice back up plan. Once this small snafu was resolved Steve and I jumped in the car and drove to the Grey Reef access area below the dam to do some wade fishing and introduce ourselves to the North Platte River in 2014. The thermometer in Steve’s Subaru registered 39 degrees as we drove along the wide two lane highway, and I was apprehensive about my ability to keep my hands in a tolerable condition to handle a fly rod. When we arrived at the parking lot we bundled up, and I resorted to toe warmers and hand warmers as I slid into my waders and pulled on my New Zealand hat with ear flaps, and my warmest down parka barely squeezed under my waders. We elected to cross the dam using the footpath and then hiked down along the opposite shore to the area across from the boat ramp. 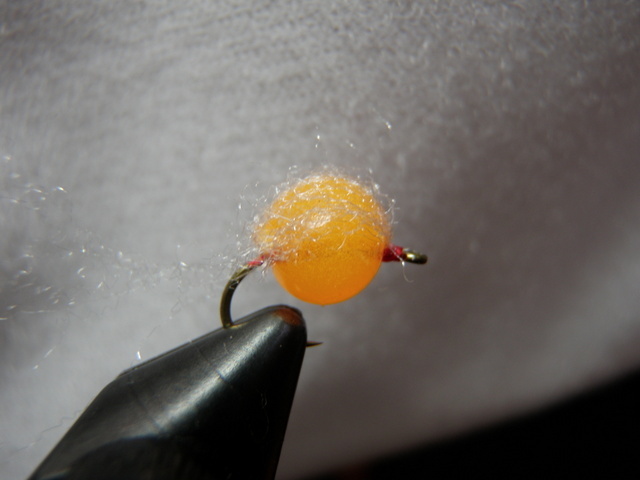 I began with an apricot egg fly and below that offered a red annelid worm with a neon orange thread head. This combination didn’t produce any action, although I was able to avoid getting my hands wet and thus the uncomfortable bone chilling cold that comes along with that experience. Eventually I removed the annelid worm fly and replaced it with a chocolate brown chenille San Juan worm as this fly produced several fish during my wade fishing in 2013. The chocolate worm did in fact produce a fish, but it turned out to be foul hooked, so I had to get my hands wet under the most unfavorable circumstances; releasing a fish that didn’t count. I failed to bend down the barb on my egg fly and as I released the foul hooked rainbow, the egg fly got stuck in my net. After much twisting and pressure on the egg, I was able to free it, but the hook now penetrated only the bottom one fourth of the soft sphere. I thought about switching out the egg fly for another newly tied model, but given the cold conditions, I decided to gamble with the cripple. Sure enough I moved up to a wide riffle stretch of moderate depth, and the indicator paused, and I set the hook and felt a pulsing weight on the other end. The euphoria of a live fish only lasted for a moment, and then the fish popped free. I reeled in my flies to inspect, and it should be no surprise what I saw; the fish apparently bit the egg and pulled it off the hook! Steve and I continued working up the left bank with minimal success, and then we crossed to the side next to the parking lot and found some nice water below a cluster of fishermen pounding the flume where the water pours from the base of the dam. At some point during this interim time I snagged my flies on a rock or stick and broke them both off, so I tied on another apricot egg fly and returned to the red annelid worm. I positioned myself in a nice spot where the main current spilled over some large rocks and created a nice deep tail out, and here I began drifting my two fly combination. Unfortunately there was some sort of snag eight feet below the head of the run that kept grabbing my flies on every other drift, but when the indicator dipped on the third pass I set the hook anyway and felt something throbbing like a live fish. Sure enough I got a glimpse of a rainbow, but just after seeing the fish, the rod stopped throbbing and I was once again attached to a non-living underwater obstacle. I worked my flies free and moved down a bit so I could fish the bottom of the run and avoid the annoying snag. This proved to be my best move of the day, and on the fourth or fifth drift I felt some weight and set the hook and began to battle a strong rainbow. Eventually I subdued my combatant by sliding my net underneath the bright rainbow. Since this fish was my first landed fish of the trip and roughly 17 inches in length, I couldn’t resist taking a photo and in the process submerged my left hand in the icy currents of the North Platte. After snapping three shots, I released the rainbow and thrust my hands in the wader bib pocket and clenched the hand warmers for ten minutes. Once my hands arrived at a barely tolerable state again, I resumed fishing and had one more momentary hook up, but Steve wasn’t having much success either and the sun was sinking in the western sky, so we decided to adjourn to the Hampton Inn and dinner in Casper. The woman at the front desk checked us in and then recommended a restaurant called Poor Boys a couple blocks away. We took her advice and enjoyed a pleasant dinner before returning to the warmth of our hotel room. Despite the frigid temperatures we managed to land a few fish and tested out the flies we diligently tied in preparation for our Wyoming trip. The weather forecast predicted highs in the low 50’s for Tuesday, so we anxiously anticipated our full day float. Would we have as much success as we did in 2013? Stay tuned. 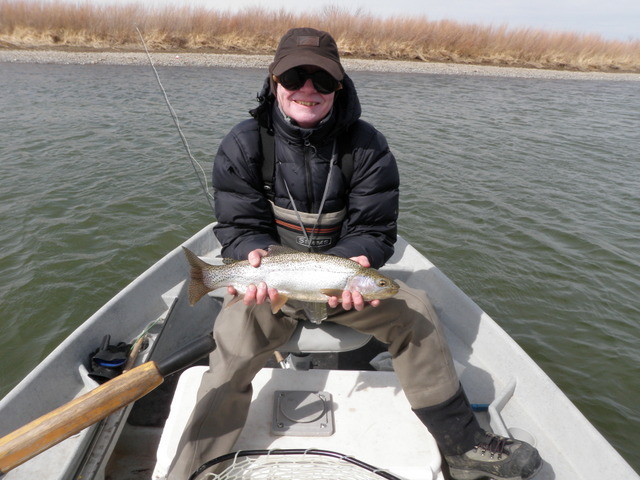 During the last week of March in 2013, my friend Steve and I booked a one day guided float fishing trip on the North Platte River below Grey Reef. Neither of us had ever fished there, but after seeing a presentation at the Fly Fishing Show in Denver, we decided to book a trip at the reduced rates offered prior to April 1. The weather was quite chilly, but the fishing was amazing. We spent the day floating in a drift boat and fishing almost entirely with annelid worm flies and egg flies. 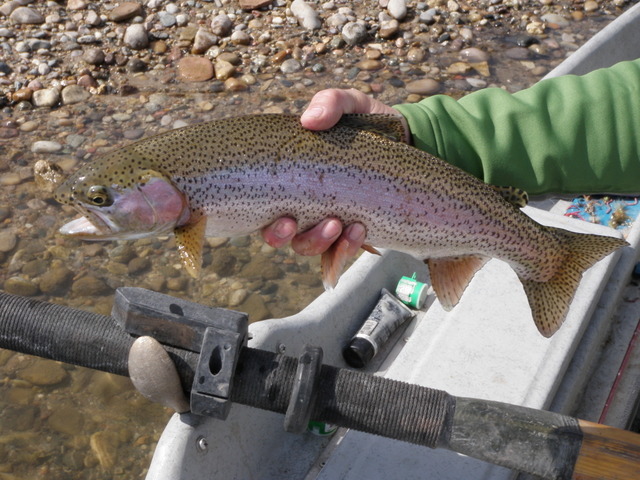 We each caught a huge quantity of fish, and most were rainbows in the 15 – 20 inch size range. Based on this enjoyable experience we decided to book a trip again for March 25, 2014. This time, however, we knew what flies worked so I decided to tie worms and eggs in preparation for our trip. It seemed ridiculous to me to pay $1.50 or $2.00 per fly for these simple imitations, and after tying a supply of each, I was proven correct. 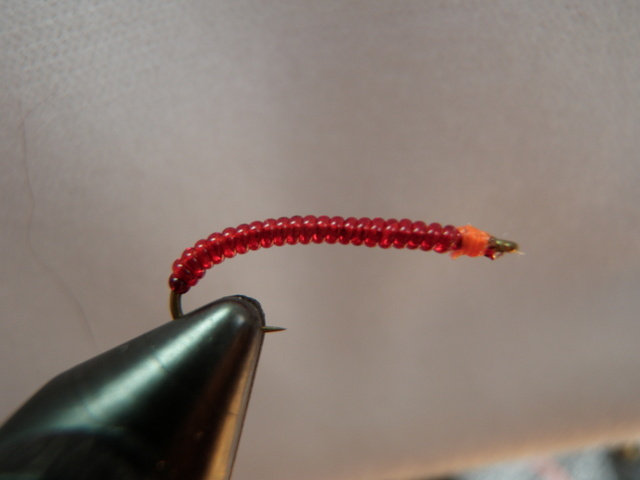 I began with the annelid worm fly, and after watching a YouTube video on how to tie this simple fly, I headed to Charlie’s Fly Box and purchased some red D-rib material. That’s all I needed as I already had 200R hooks in size 12 and 14 and red thread. I whipped out 15 of these red worms in no time. Five were size 12, and ten were size 14. I made five of the size 14 worms with a fluorescent orange thread and five with red thread. I’m anxious to see if the small fluorescent head has any attraction ability. I delayed making the eggs until the last week before our trip, but once again traveled to Charlie’s over my lunch break and purchased materials to make egg flies. 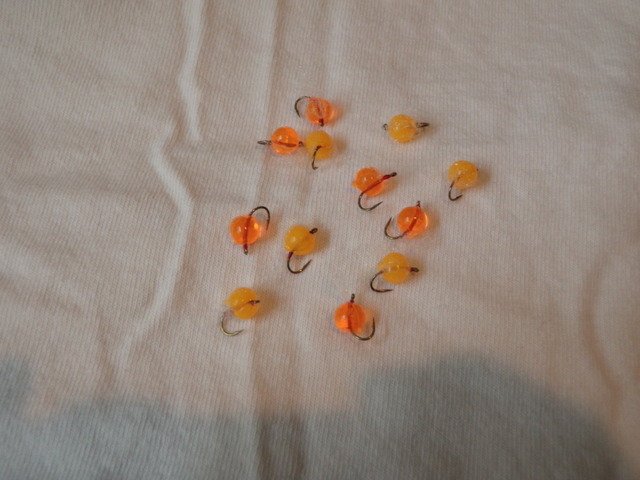 The salesman in the shop suggested using otter eggs and otter egg white veil material, so I purchased these along with 25 Tiemco 2488 hooks. Again I found a YouTube video demonstrating how to tie these basic patterns. Over the span of a couple days I churned out ten apricot colored egg flies and then made another six pink colored eggs. Both look great and I am optimistic that they will produce numerous nice rainbow trout in the North Platte tailwater below Grey Reef. Steve arrives tomorrow morning between 8:30 – 9:00AM, and I am extremely anxious to see if we can replicate last year’s success. Once again the water managers will be creating a flush, but in 2013 our guide knew the strategy to work around this circumstance, and in fact the flush tends to push worms and eggs loose from the river bottom which only enhances the fishing. The weather is a bit of a concern for Monday when the high is projected at 39 degrees; however, Tuesday and Wednesday are currently forecast to reach the low fifties, and that is tolerable if properly dressed. I’ve packed hand warmers, toe warmers, my New Zealand winter fishing hat, and several layers of fleece and down. Wyoming here we come. The story of March 20th actually began with my birthday, sort of. I came down with food poisoning and pretty much shared my birthday with the bathroom and bed for an entire day. Consequently I missed the Runnin’ of the Green, a 7K St. Patrick’s Day road race that I’ve participated in for the last four years. Our friends Allan and Beatriz, who live in Houston, TX were arriving in Denver on Sunday, and we made plans to meet them for brunch once I returned from the race. Finally Jane was planning to prepare salmon wrapped in pancetta and grilled on a skewer for my Sunday birthday dinner. I missed it all. 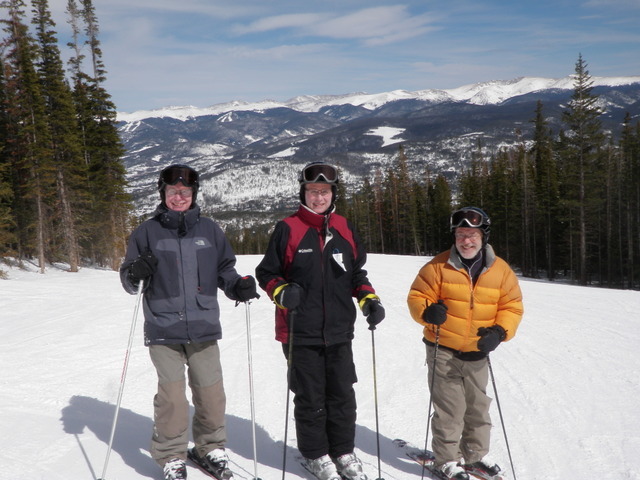 I also knew my friend John Broadbent was in town the week of March 17, and we made plans to go skiing during his last one week stay during the ski season, so as I suffered with my illness, I worried that I’d miss the opportunity to spend a day with John on the slopes. 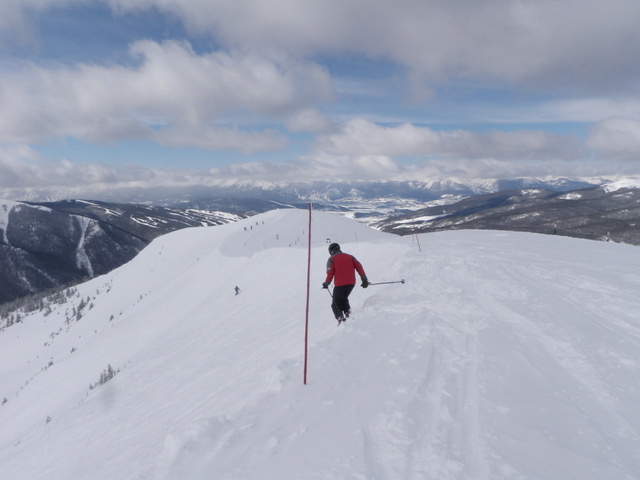 My recovery was not an even, positive sloping trend line, and I continued to fret about whether I’d recover enough to join Allan and Beatriz and John for a day of spring skiing. 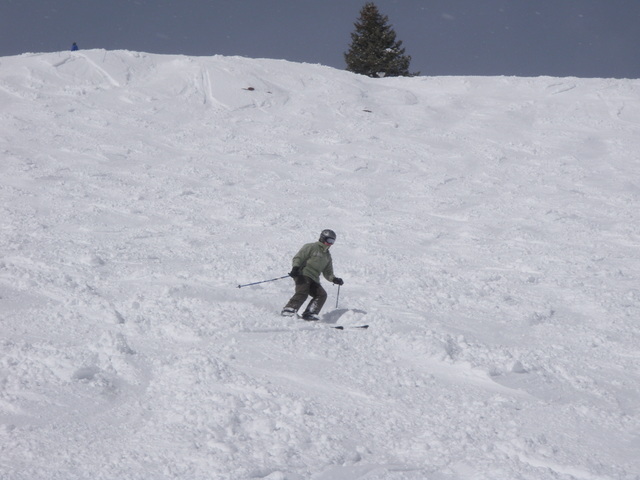 Even when feeling 100%, skiing difficult terrain at altitude in frigid temperatures is a physically taxing prospect. I felt much improved by Wednesday evening, so I made the decision to make the trip on Thursday, March 20. Jane had already cleared Thursday as a vacation day, so I contacted John, and he volunteered to meet us at our house at 7:30. Allan actually called me, and we arranged to meet at the Peak 8 lodge at 10AM. I was now committed, so hopefully my body would cooperate. As it turned out, I made a solid decision. The weather cooperated and we enjoyed blue skies and sunshine, although the air temperature remained in the thirties thus avoiding slushy snow conditions, yet allowing reasonably comfortable air temperatures despite some ever-present wind. 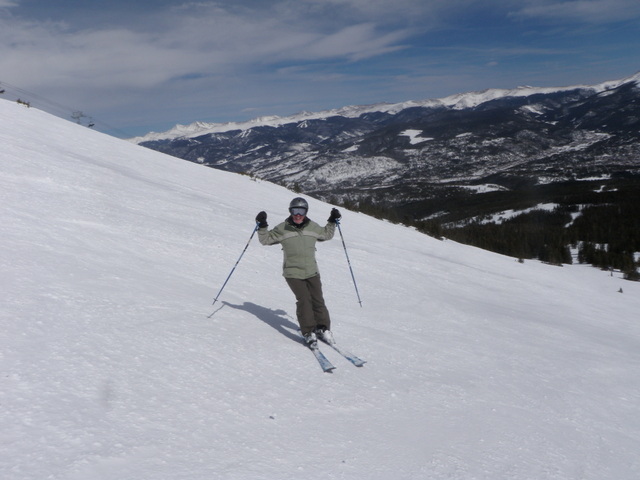 Jane and I had a great time skiing all the peaks of Breckenridge with several of our best friends. 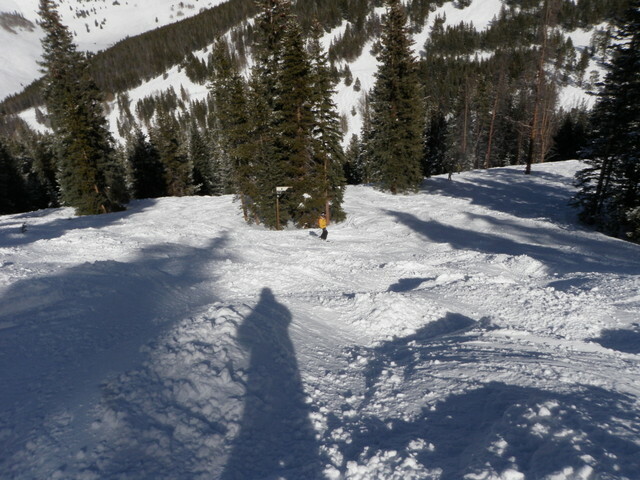 A highlight of the day occurred during the afternoon when we ventured up to the new Peak 6 area and had a blast swooping down the moderately moguled bowl from the top of the six person chairlift. 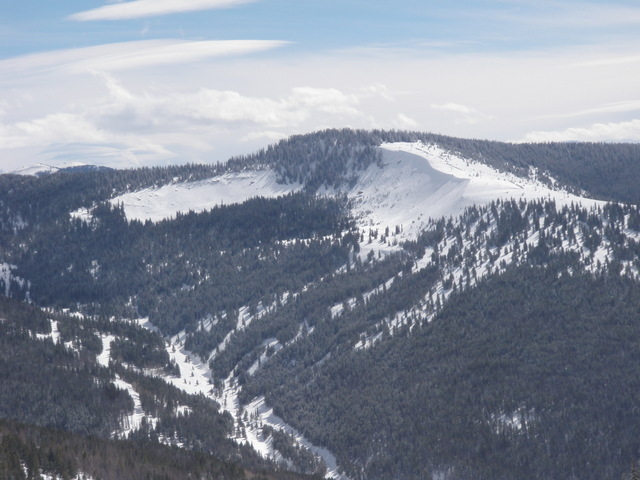 Jane and I both resolved to return to Peak 6 before the season ends to build on our small sampling of new terrain. Allan and Bea treated us to a satisfying lunch in their ski in/ski out condo near the Quicksilver lift, and for apres ski we reciprocated by serving them with some tasty vanilla porter draft beers. It was a fun day, and we were all in the mood for celebrating. My birthday travails are quickly fading into a forgotten memory. I fished once in February for roughly three hours on the South Platte River below Deckers on a day when every fisherman with cabin fever in Colorado decided to venture outside to enjoy the abnormally nice weather. I failed to land any fish, and this brief experience served to wet my appetite for a legitimate fishing day. I examined the weather forecast regularly in hopes that there would be another nice spring day, and sure enough the high for Denver on March 13 was projected to touch the low 60’s. Meanwhile the Royal Gorge Angler web site announced the arrival of molting golden stoneflies in the Arkansas River corridor and the presence of blue winged olives in Canon City and lower Bighorn Sheep Canyon. The confluence of these factors was all I needed to schedule a day trip to the Arkansas River on Thursday March 13. As I left the house on Thursday morning I felt both excitement and apprehension. Ever since the first day of trout season in Pennsylvania during my youth, I get extra excited for my first serious fishing outing of the year. At the same time there was a sliver of doubt that I could still catch fish after a winter layoff. I knew the air temperature would be quite chilly in the morning, but I left the house at 7:20 in spite of this sound reasoning. It was my first day trip to the Arkansas River, and I have to admit that there was an extra dose of adrenaline circulating through my body. My lack of patience haunted me as I encountered heavy rush hour traffic at the junction of I225 and I25, but once I negotiated this slow stretch, I resumed normal speeds and made the trip in three hours. The dashboard thermometer displayed 49 degrees as I turned into the pullout .5 mile upstream from the Spike Buck access area, but when I exited the car it felt more like the upper thirties with a cutting wind slicing through my shirt. I decided to wear my down vest in addition to my Adidas pullover and supplmented these layers with my recently purchased New Zealand fishing hat. Because of the wind and the likelihood of cold water temperatures, I assumed that I’d be fishing deep most of the day, so I assembled my Sage 9 foot, 4 weight and then configured my nymphing rig using a Thingamabobber and five foot section of level 3X line. When I was ready, I walked down the road for two-tenths of a mile or so and scrambled down a steep rocky bank to the river. The flow was fairly normal for March, but some low level snowmelt upstream was causing a tinge of cloudiness, although I concluded the clarity would not be an issue. I began my day with an Arkansas rubber leg to imitate the lighter coloration of molting stoneflies, and then I knotted a copper john to the point 18 inches below the stonefly. I reminded myself that I committed to using the copper john more frequently, and when would a better scenario present itself than slightly murky cold early season flows? This was all sound reasoning but I fished a twenty yard stretch of river with no action, and it was now approaching 11AM, so I decided to abandon the copper john and put my faith in an RS2. This proved to be a solid move and I hooked but failed to land a fish that apparently spit out the tiny RS2. After this second failure of the season to land a hooked fish, I experienced another unproductive period, and the Arkansas rubber legs wasn’t doing anythng, so I clipped it off and replaced it with a Dave’s beadhead hares ear. 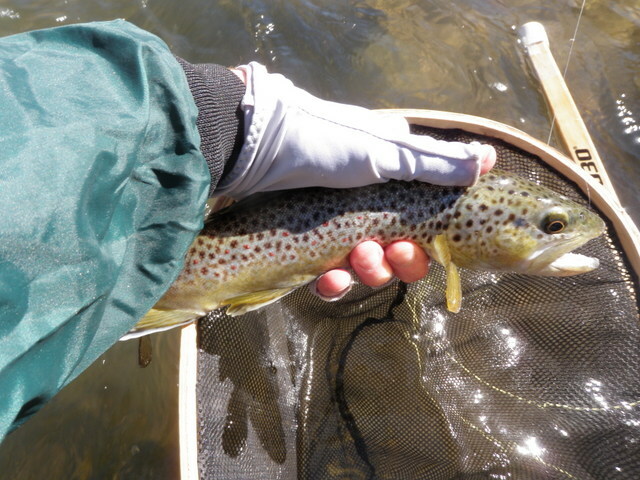 The hares ear and RS2 combination finally paid dividends, and I landed a skinny 12 inch brown on the RS2 by 11:30AM. This was my first landed fish of the year, so I paused to photograph the spunky brown just above the water and quickly returned it to the icy flows. After reading an article about the significant increase in mortality when exposing a trout to air for more than 30 seconds, I’ve pledged to really limit my photography to shots of fish still in the water or held just above the water, and I honored my pledge on Thursday. 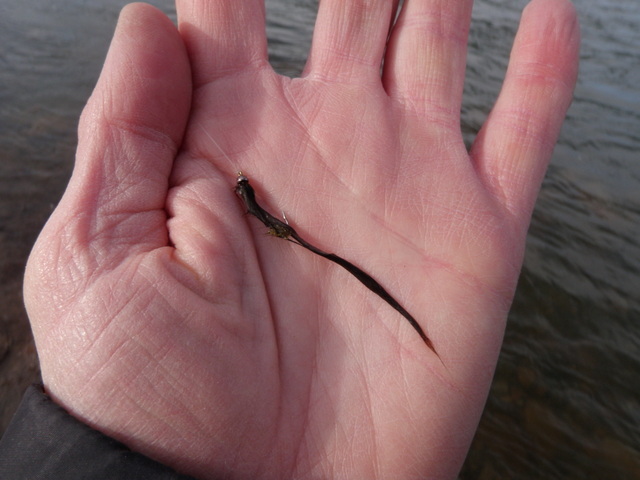 I decided to move along at a more rapid pace as the key seemed to be covering a lot of water, and by noon I’d landed two more small brown trout on the beadhead hares ear. It was good to discover that both the RS2 and hares ear were capturing the attention of the Arkansas River brown trout. By noon my left hand was curled and stiff and displayed the appearance of a red claw, so I quickly returned to the Santa Fe and the welcome shelter from the wind and ate my lunch while my hands warmed up. After lunch I attempted to fish without my down vest and New Zealand hat, but after moving to the edge of the water just below the car, a stiff wind kicked up and made me reconsider. I returned to the car and added a fleece layer to the Adidas pullover and donned my New Zealand hat once again. After another slow period I abandoned the hares ear and RS2 and experimented with a 20 incher and BWO emerger. 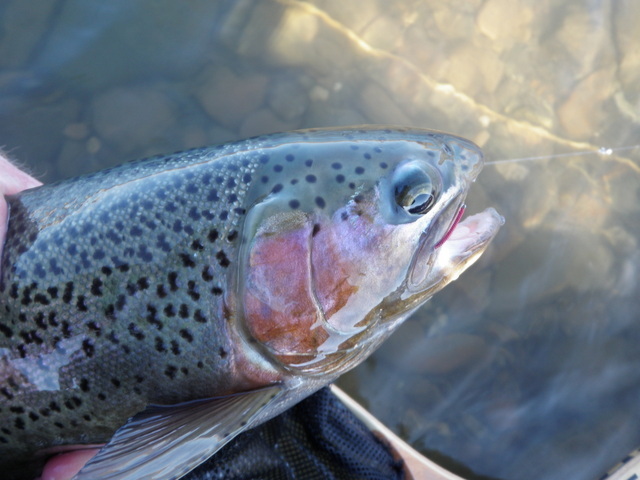 The reports stated that the stoneflies got darker after molting thus my move to the 20 incher; and my thinking suggested that perhaps the fish would more readily see the soft hackle emerger in the slightly olive-tinged water. From 12:30 until 2:00PM I continued working my way upstream and covered a lot of water before I added a fourth fish from a nice deep run in the channel closest to the road that flowed around a small island. Shortly after this I snagged a rock or stick and ripped off both flies so I tried an iron sally and returned to the RS2. Very few fishermen were present on the Arkansas River on Thursday, but as I moved around a bend in the river I encountered one. He waved his hands apparently to let me know he was there, so I beat a hasty exit and walked down the road to the Santa Fe. The fishing wasn’t that great anyway, so I moved back down route 50 to a small slanted pullout just beyond the entrance to Spike Buck. 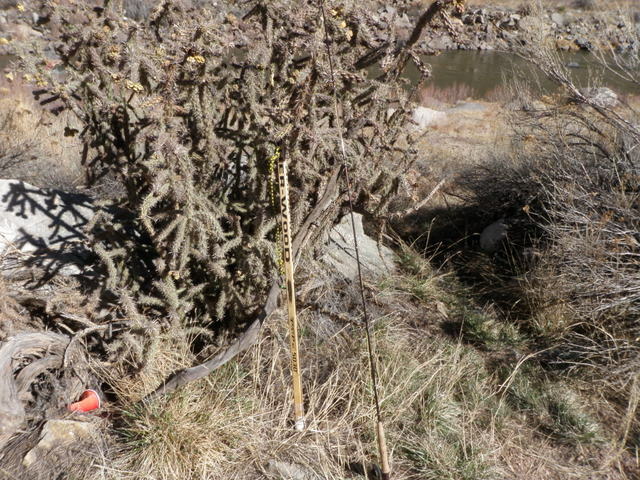 I grabbed my gear and crossed the highway and walked downstream fifty yards or so and cut down to the river. For the remainder of the afternoon I fished along the bank closest to the highway and covered all the slower moving pockets and pools. Some clouds moved in and blocked the sun off and on, and this seemed to provoke even more wind, but I stuck with my method and managed to land two additional small brown trout on the RS2. The last two fish seemed to respond to the swing that naturally took place at the end of the drift. It was nice to land six fish in my fist full day outing of the season, but it was a slow day by any measure. Six fish in five hours of fishing is a slow catch rate, and the size of the fish was disappointing both in terms of length and weight. I attribute the slow day to wind, icy water temperatures, and the corresponding lack of insect activity. I did not see a single blue winged olive and only observed sparse clusters of infinitesimal midges after lunch. Despite these factors, I’m already noticing a weather forecast for highs in the seventies during the early part of next week. I’m always optimistic. 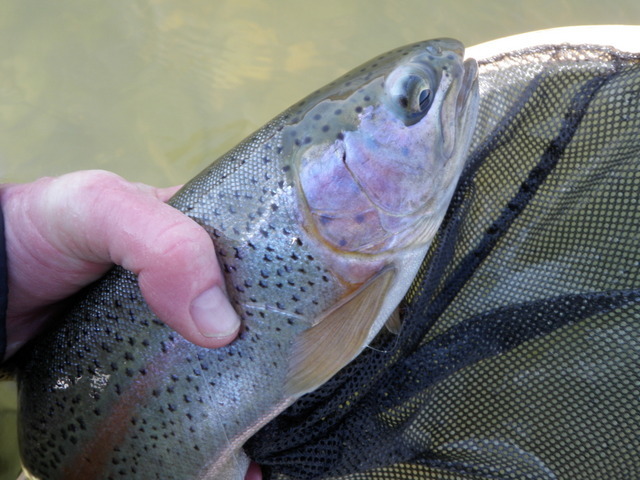 I can remember numerous frustrating outings on the South Platte River during fairly dense blue wing olive hatches when I was unable to catch a single fish. At the time I was probably using a parachute adams or a small comparadun. The comparadun served me well in larger sizes, but it was next to impossible to produce a size 20 or smaller imitation with a slender body due to the density of the deer hair wing. This frustration caused me to evaluate other wing materials, and when I read about CDC and its water repellent qualities, I decided to try using it as a replacement for deer hair. CDC is very light and compresses well at the tie in point to enable a slender body, yet it looks fluffy and bulkier when dry for a visible wing. In addition its water repellent qualities allow it to help float the body of the fly, and the sihouette of the fly remains in line with the comparadun style. I tied some one winter, and the first memorable success with these flies occurred on the Williams Fork tailwater above its junction with the Colorado River. A friend and I chanced upon a very dense blue wing olive hatch during August late in the afternoon, and I pulled a CDC olive from my fly box and tied it to my 5X tippet. This fly produced some sensational results over a two hour period in a large pool on the Williams Fork, and ever since then it has become a mainstay in my flybox. My partner during this outing was using a parachute style BWO, and his results did not come close to the success that I enjoyed. I’ve enjoyed numerous additional successful experiences using the CDC olive during intense BWO hatches on the Frying Pan River, Colorado River, South Platte River, Arkansas River and Big Thompson River. The only downside to the CDC blue wing olive is the difficulty encountered in refreshing the wing after catching a fish. Once the CDC wing gets wet it has a limp narrow profile so I typically dip the fly in dry shake several times, blow on it, and continually fluff it with my finger until it gets back to a reasonable wing appearance. If it is raining as is often the case during a strong BWO hatch, the task of drying the wing becomes even more problematic. I put up with this extra effort and the extended fluff time because the fly is so effective. 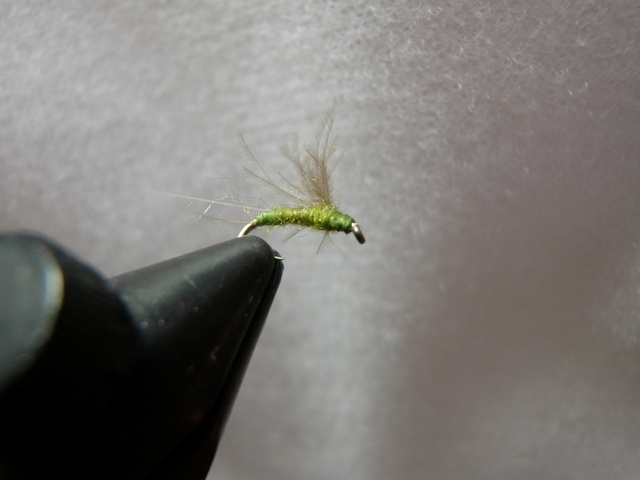 I’ve recently considered substituting snowshow rabbit foot hair for the CDC in a comparadun style BWO imitation. Now that I’ve worked with snowshoe rabbit hair in the muggly caddis, I recognize that it might be a nice compromise between deer hair and CDC in terms of being lighter and able to compress to minimize body bulk, while at the same time presenting a stiffer wing that can be dried faster after being submerged. 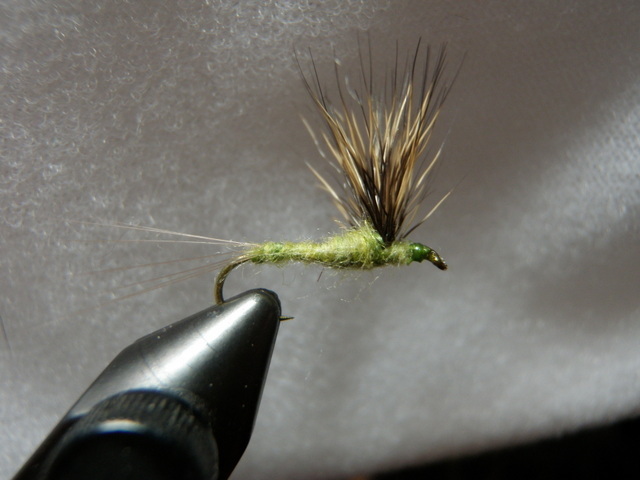 For now I tied 10-15 additional CDC blue wing olives in two different shades of light olive for the upcoming season. One olive carries a more yellowish hue, while the other is more green on the color scale. Hopefully I’ll experience some strong BWO hatches soon on the Arkansas River so I can verify the effectiveness of my recent tying efforts, and maybe I can find some time at the vice to make a few snowshoe olive prototypes to test. 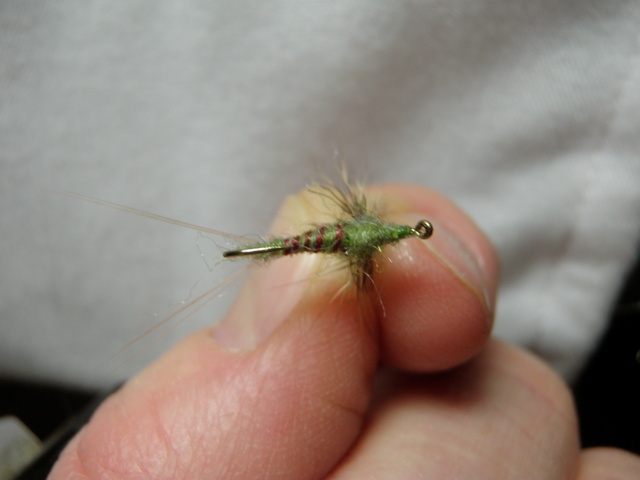 When I last reported on green drake imitations in 2013, I felt I solved my poor flotation problem of comparadun green drakes by tying some attractive parachute flies in size 14 and 12. 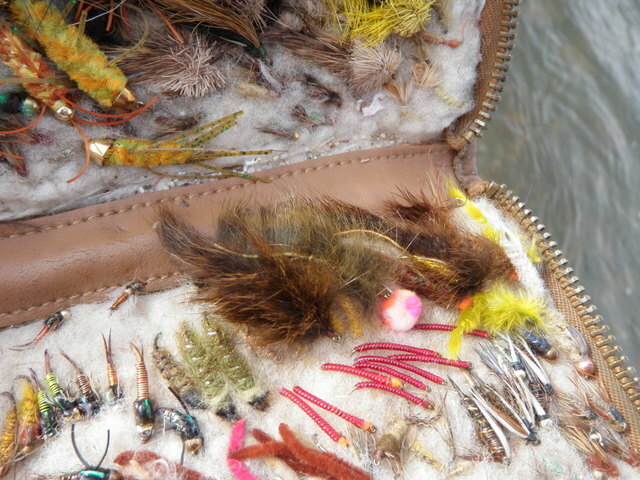 I constructed these flies with more moose mane fibers for the tail and a parachute hackle to assist in flotation. Unfortunately the puzzle is never completely solved in fly fishing. Early in the season I experienced some fine results using my new parachute green drakes on the Big Thompson River and also during my first trip to the Frying Pan River. Unfortunately as the season progressed, and I made two subsequent trips to the Frying Pan River, I discovered that the paradrake was not the total answer. I encountered several significant hatches where the old comparaduns outperformed the parachute style fly, and in one instance achieved some success with a parachute fly purchased from Taylor Creek Fly Shop. I’ve now come to believe that the green drakes that appear late in the season are drunella flavilinea, and these are smaller and best imitated with a size 14 fly with a more slender body than that of the larger size 12 early season green drakes. I’m guessing this explains why my parachute green drakes worked well during my first visit in mid-August, but the same flies proved too large during my September days on the Frying Pan River. With this hypothesis in mind, I returned to my vise and produced some new green drake comparaduns. In order to address the flotation issue, I tied them with six microfibbets split in a wide V for the tail thus providing large outriggers to support the fly. 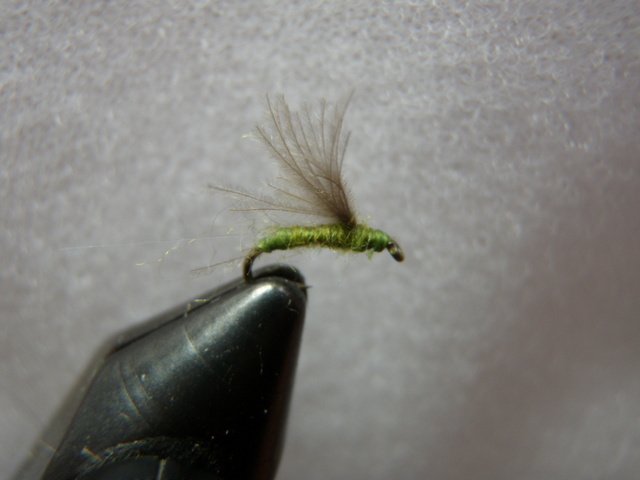 Because I had some success with a purchased parachute green drake with a light olive body exhibiting more of a yellow tinge, I made five with a similar dubbing. 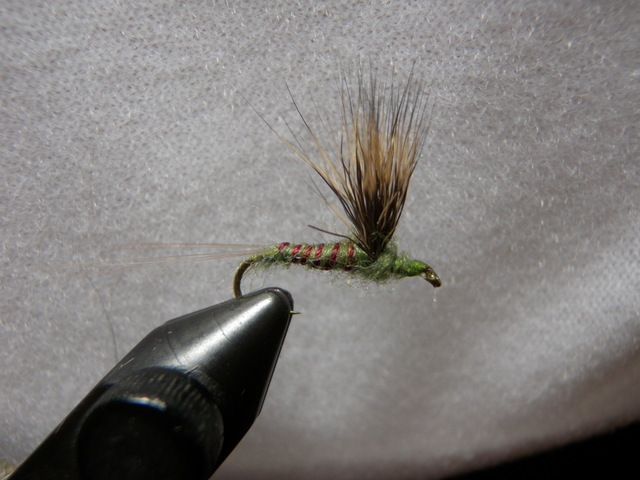 I also covered my bases by tying five with my previously favored light olive and maroon thread rib. Finally I refurbished five carry over comparadun style flies by carefully adding more microfibbet tails for better support. These were flies that did not float well when presented two summers ago thus leading to the parachute green drake experiment. I now believe I have numerous options that will serve my needs depending on the size of the green drakes and coloration of the body. The challenge will be to observe and identify what is transpiring on the water and to select the correct option for the situation. 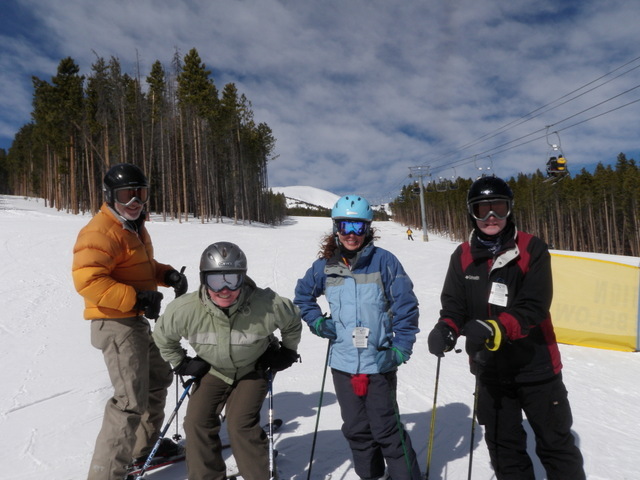 Skiing with a group of friends is a lot of fun, and Friday was one of those days. 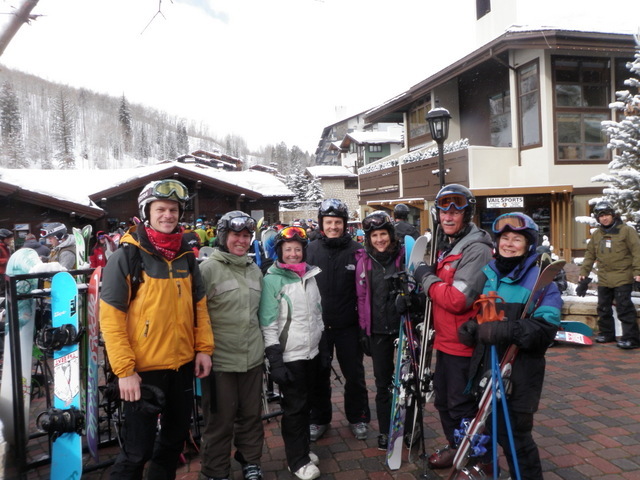 A group of eleven gathered at Vail and enjoyed some fine weather and fresh snow while renewing friendships. The most difficult aspect of the day was trying to keep a group of eleven together, and we did not succeed, but it was a great time nonetheless. Our friends, the Gaiges, hosted their daughter Jacy and boyfriend Billy for a short winter break as they flew to Denver from Washington DC on Wednesday. The Gaige family joined our other friends, the Youngs, at their rental house near Dillon, and their son Brady and wife Kara joined the group on Thursday night. Jane and I drove to Frisco on Friday morning where we met the rest of the group, and then we car pooled from Frisco to Vail. 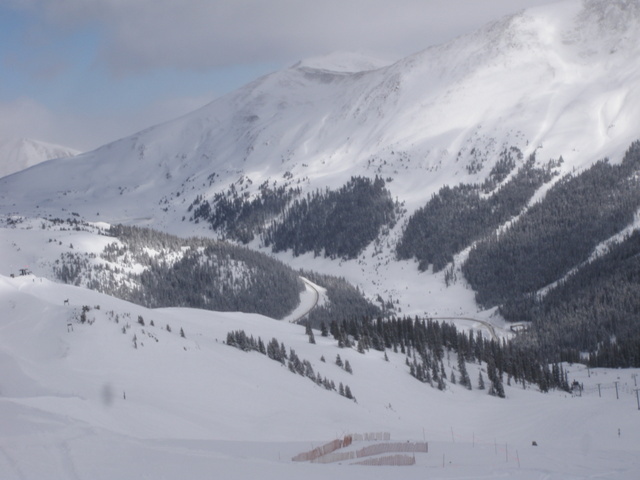 Unfortunately when we arrived at the Lionshead parking lot at Vail by 8:45AM, we learned that the Born Free express chair was not functioning so there was a one hour wait in the gondola line. We elected to board a shuttle bus and transferred to Vail Village where we found the line for the Vista Bahn gondola shorter than the lift lines at Lionshead. We were finally able to launch our ski day by 10AM. It was well worth the wait as the clouds burned away, and we experienced sunny skies and temperatures in the low 30’s most of the day. The four inches of fresh snow was mostly chopped up by the time we touched down in Game Creek Bowl, but we still managed to find some nearly trackless powder. 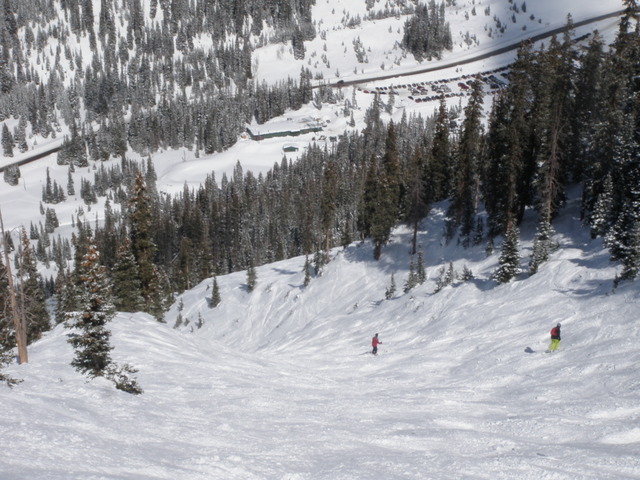 Even the slopes that were tracked out held nice light snow, so while not fresh untracked powder, the snow conditions were still quite conducive to soft turns and controlling speed on moguls. Perhaps the highlight of the day was our apres ski stop at Q4U, a “hole in the wall” barbecue joint on Summit Avenue in Frisco. Our group met there after an active day of skiing and enjoyed two pitchers of beer and fine barbecued meats. It was a great way to begin a weekend in February.